In this post: Island Countries study with Japanese and Icelandic food, fun, and crafts! 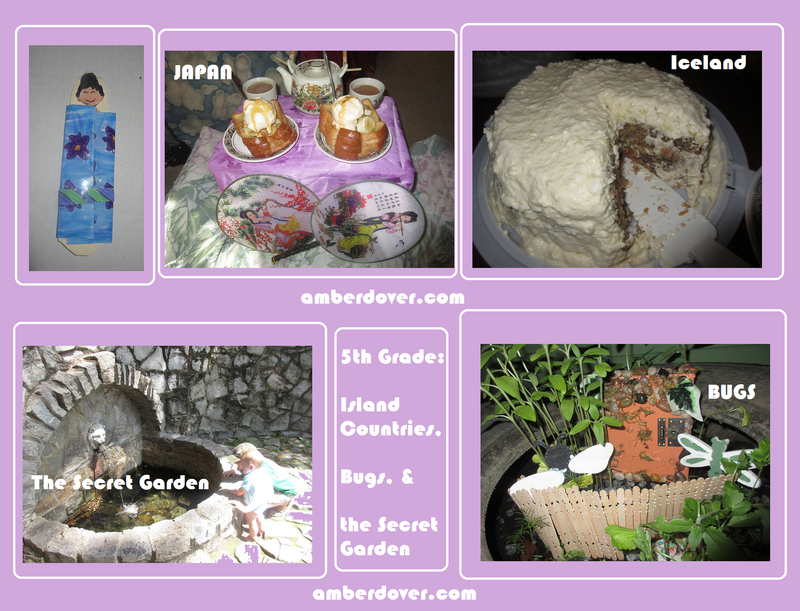 Also, The Secret Garden and a Bug Study. Join us for a trip back to our 5th-grade studies! Hello, Dear Ones! This is my 8th post for our 5th-grade studies from a couple of years ago. In geography, we learned about Island Countries: Japan, Iceland, and Cuba. In science, we learned about bugs. We read The Secret Garden for Language Arts. We had fun exploring and delighting our taste buds. We did these studies in the spring of 2016. Here’s how we learned! Cuba- We did very little for Cuba but we did make a cute bird craft. We also did a chart on the average rainfall in Cuba. Japan- We had a lot of fun with Japan…from food to crafts. A Japanese dessert/breakfast along with tea! This was the best part of the week. You simply must try this delectable dish! I made an anime version of our Asian fans and colored it. Then I uploaded the picture to my computer and printed it out on wax paper. It was a simple transfer onto a fan I made with pantyhose and a clothes hanger. I love Feature Films for Families. My grandma bought me several videos as a kid. They were selling them at school. They are all G-rated and have discussion questions on the back for family time. The videos teach family values and acceptance of different cultures. The Best Bad Thing is about a Japanese American girl who goes to live on her traditional Grandma’s cucumber farm for the Summer. She learns about immigrant persecution and family heritage. We had some very American Asian meals from the freezer section. Iceland- I’ve had a thing for Iceland since I saw The Secret Life of Walter Mitty. That movie really encouraged me to dream big and go to Belize for missions. I recommend the movie for older kids. It moves slow and there’s one inappropriate part. Michael enjoyed the movie, but he does fine with slow movies. The Secret Life of Walter Mitty also shows an Icelandic volcano erupting and we learned about volcanoes too. Prune filling…It was actually quite yummy. The Secret Garden- I loved this book and the movies as a child. We had fun exploring and making a tiny door. Project board with coloring pages and butterfly stickers. A magical garden door small enough for a fairy! Famous gardens- This is an old science book we have. You can find pictures of famous gardens online as well. We had fun in our own Secret Garden in downtown with Nana! It was cool exploring local “gardens”. A trip to the Botanical Gardens would be great too. Bug Study- lapbooks from previous bug studies. Painted Wooden Bugs- We bought these from the craft store. Stained Glass Beetle- Michael traced a beetle onto wax paper with Sharpies. a bumble bee- This one did have to die. The elusive and creepy but super helpful house centipede! I’ve seen this bug several times. The first time I saw it I freaked out. Now I just put them outside. They are VERY fast and I can’t bear the thought of sleeping with one in the room. Not so much a bug but still creepy cool…the snail. An origami grasshopper, which also went with our Japan study.